If you are a baby boomer, then you face some unique issues when it comes to work. Those of you who have had a job for 20 or 30 years (or more) are usually ready to retire, but aren’t necessarily ready to not work either because you don’t want a lot of free time on your hands or you can’t afford to financially. Some of you may have even lost your job due to the economic downturn and now find yourself trying to compete with people half your age for a job you really don’t want. What are you to do? Have you considered working remotely? Luckily, the Internet spans most areas of the globe, allowing you to work from anywhere. You can set your own schedule and create your own routine (allowing you to work around family and other obligations) right from the comfort of your own home. Additionally, you have built up certain skill sets, which I would argue are 100% transferable to the LiveWorkAnywhere model. This greatly increases your online work options as a baby boomer looking for a full or part-time career. There are several jobs in which you do not have to actually be there in person to perform. If you had a career as a trademark attorney, for example, perhaps you could transfer your skills to consulting and meet your clients via web and phone. If you were a sales executive, get rid of the car, use a US-based number and make calls from wherever you live. You can even hire a team to do the majority of the work for you while you focus on client acquisition. Perhaps there is another service you can offer to your existing client base? Something you can do without even leaving your house. Baby boomers have many online work options, allowing them to live and work remotely. Telecommuting is not a buzzword, it’s a reality. You start with your dream and your skills and work backwards to find flexible work that you will enjoy. That’s all fine, you say, but what if you don’t have time to start with your dream? What if you need something NOW? So What Are Your First Steps as a Baby Boomer Who Wants to Work Remotely? Are you on LinkedIn? If you are, is your profile current? How many connections do you have? You should have at least 500+ so, if you don’t, then you need to get busy. Join groups in your field and network with others. Connect with other baby boomers who work remotely in your field so you can learn from them. What are your skills? To answer this, simply take your resume and transform it into a business portfolio. If you were an attorney, for instance, make a list of all of the professional services that you would offer and include some key milestones from your career. Package yourself to market yourself. Create a website (there are several ways to make a free website – weebly.com, wix.com, wordpress.org, squarespace.com and Google sites, just to name a few) where you can showcase all of your talents. If you don’t want to spend time creating and marketing a site yet, then you can at least sign up on a site like Elance.com where you can build your own profile and have them market it for you within their freelancer marketplace. Know how many hours you are available, the wage you want to make (be sure to look around so you are price competitive with the market – too low is okay to start, but doesn’t show high quality; too much and you’ll drive potential customers away), and what your monthly revenue goals are. The more you know what you want, the easier it is to create the routine to get it. Nothing new is ever easy. You will be challenged. But you spent your entire professional career meeting challenges head-on and look how far you’ve come. You can transfer your skills and create supplemental income or even prepare to hit the road with your new business and be successful no matter what stage of the game you are in – even as a baby boomer. Tell me – what other questions do you have? Where should we dig in deeper? Do you help folks do this? If so what’s your billable rate? Is their a course I can take? Could you go into more depth – the commentary – although agreeable – lacks fundamental specifics. Can you provide links to partners who might guide to my goals – for instance are there resources I can use. Are their communities of ex-Pats I can engage. I don’t know what to do first. I always need to have a job or role or client first – so to just get up and go to let’s say Australia which has a huge time difference to the states would be so challenging – what’s your strategy? Can you help me? With statistics too? Thanks for sharing, Becca! It’s great to know there are resources out there for baby boomers who are looking for more flexible options. Thanks, Mariann, a lot of great questions. 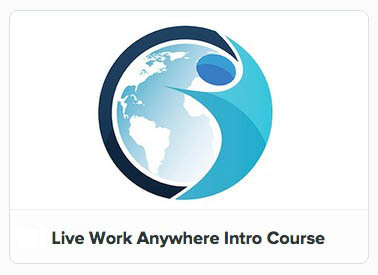 There are courses on LiveWorkAnywhere.com that are basic Introductions for taking the first steps toward a life of living and working remotely, including things like planning your routine, managing remote teams, creating your work schedule independent of timezone, creating an action plan, etc. If you were running a business, on AnywhereStartup.com, there are more in depth courses on specifically how to test, create, and launch a startup and run it from any location with wifi and power. But the strategies are similar for contract or freelance remote work. If you are interested in 1:1 coaching, please contact me via the Contact form. Happy to help customize a plan for you! Hi, I saw your businesses that you founded and have one question. I do understand that all are legal 🙂 so what country of residence do you prefer for business ? maybe you have a post of article for that ? I am from Poland and we have a lot of taxes to pay ( I am not talking about income tax) . I mean could survive a month in most countries for those taxes ;(. Thanks for your question, Tristian. I’m actually still running everything out of the US right now, but I have a list of countries I am looking at for tax reasons, including Hong Kong, Ireland, Holland, and Dubai, among a few others. I will be writing a post soon about the advantages and disadvantages of each. How high are taxes in Poland? From what I understand, you can set up a business there as an entrepreneur or solo corporation or you can also set up a limited liability company that can transfer money to you, and that might reduce taxes.